The Zoom and Max Air technologies in the midsole work because a large number of Nike LeBron XIII Low Premium owners say the shoe delivers a ton of responsiveness and comfort. Many wearers say that these LeBron James basketball shoes are true to size. A huge number of shoe owners mention that the soft gum rubber outsole has an amazing grip on any court. Several reviewers leave comments that the shoe provides excellent impact protection. A good number of buyers say these LeBron shoes are aesthetically appealing. The one-bootie construction of the shoe model is loved by plenty of users because it fits and conforms to the shape of the foot well. A large number of buyers prefer to use the shoe casually. They do not recommend this shoe for playing basketball because it does not provide enough ankle support. Some wearers feel the same way with the KD 11 from Nike. Some wearers complain that the shoe lacks ventilation. The Zoom units in the forefoot do not deliver any cushion according to a couple of users. A handful of buyers mention that the Nike LeBron 13 Low Premium has a lot of glue stains. The Nike LeBron XIII Low Premium is a bit too expensive at $150. It does not have enough cushion and ankle support. Using the shoe outdoors is risky. Most reviewers advise new buyers to look for something else. A nice alternative would be the UA Curry 6 or perhaps the Puma Clyde Court Disrupt. However, if you are more on collecting LeBron signature shoes, this pair is a must-cop. The style and comfort delivered by the LeBron 13 Low Premium is just right for the price. 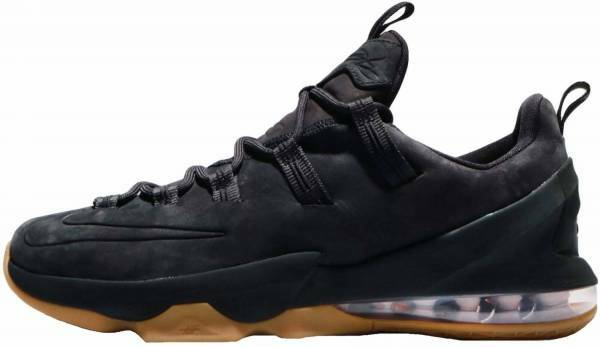 The Nike LeBron XIII Low Premium was introduced during the NBA finals in May 2017. This low-top features a fancy suede upper in a one-bootie construction. Added to the stylish design is the tan-colored gum outsole. The midsole promises impact absorption and responsiveness from the Zoom and Max Air technologies. It has the same bouncy feel as the 16th LeBron kicks. Cushion. The cushioning of the LeBron XIII Low Premium comes from the Zoom and Max Air technologies in the midsole. The Zoom units are located in the forefoot area, while the Max Air units are visible in the heel. Both are lightweight, and they effectively absorb impact; protecting the knees, muscles, and joints from fatigue and stress. Traction. The outsole of the Nike LeBron XIII Low Premium is made of gum rubber, which is a combination of natural and synthetic rubber. It comes in natural tan color and is softer compared to other rubbers. The outsole rubber provides exemplary court grip. It is durable and just great for indoor courts. Length and Width. The Nike LeBron XIII Low Premium comes in the average width and length. There are a number of reviewers who mention that the shoe has a spacious toe box that allows the toes to flex and relax. Lockdown. To keep the foot secured, the Nike LeBron XIII Low Premium uses a traditional lacing system. The round shoelaces can be adjusted to achieve the desired fit. The upper of the Nike LeBron XIII Low Premium is made of lightweight and luxurious suede. The collar of the shoe has a good amount of padding to provide comfort to the ankle. The external heel counter helps with foot containment. A debossed Nike Swoosh is found on the forefoot and medial side of the Nike LeBron 13 Low Premium. The LeBron James logo is found on the tongue and insole. His signature is located on the midfoot area, while a debossed LEBRON JAMES callout is on the heel counter. There are sturdy and dainty pull tabs on the tongue and heel counter. They make putting on and taking off easy for the wearer. The low-top silhouette and one-bootie construction of the Nike LeBron XIII Low Premium comes in two colorways: Team Red and Anthracite. The color of the shoelaces match the color of the upper for a uniform look. The Team Red colorway is also called the Night Maroon. It is described as Night Maroon/Night Maroon-Gum Light Brown in Nike’s website. These Nike basketball shoes were released on June 1, 2017 for $150.